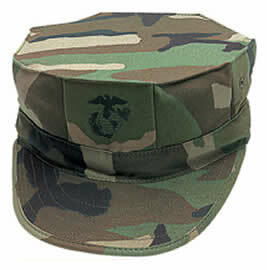 The Utility Cover, also known as the utility cap and eight-pointed cover, is the United States Marine Corps cap, worn with their utility uniform. It is an eight-pointed hat, with a peak similar to a baseball cap. It is worn ‘blocked’, that is, creased and peaked, for a sharper appearance. It is also worn by the US Navy units such as Seabees and Beachmasters. It is also worn with the newer Navy Working Uniform as well as the Woodland CUU and desert DCU uniform.